12 January 2009, at 10:42a.m. 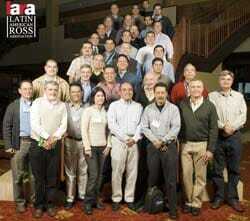 US - Aviagen recently held its annual Latin American Ross Association (LARA) meeting in Huntsville, Alabama. The three-day programme, held on 1-3 December 2008, brought together more than 35 participants from eight countries across Mexico, Central and South America to discuss the latest issues affecting the poultry industry and to share information about developments and global activity within Aviagen, specifically with the Ross brand. The meeting focused heavily on many technical aspects of breeder and broiler production. Presentations included topics such as the latest developments in research and development regarding genetic progress, nutrition and technical innovations, product performance, biosecurity and veterinary issues. "We are very appreciative of the support our customers have for the Latin America Ross Association," said Ullrich Koehler, business manager for Aviagen Latin America, Caribbean. "This annual meeting is the ideal forum for them to gain a greater understanding of key issues within the poultry industry and provides a warm, friendly atmosphere to exchange ideas and experiences." Ross continues to expand across Latin America and the latest meeting included attendees from Brazil, Chile, Argentina, Peru, Mexico, Venezuela, Colombia and the Dominican Republic.